These days I can’t help but worry that people won’t always appreciate literature as they should – that everyone will have a Kindle and no one will have any books – that children will only want to read if it’s on a screen – that people will forget the classics and anything that isn’t new or award winning. These are ‘topical’ fears but they aren’t new. Ever since literacy became widespread and part of the life of the everyday person, people have been worrying that literature is not as appreciated as it should be. And yet. Stories are an integral part of almost every society, in some way. Even if people don’t have paper to write on, they tell stories. Tribes in the jungle and in the Arctic, people who can’t even read – we all have stories. Fairy and folk stories are a huge part of European cultural history (as they are for other parts of the world too). In the same way that the stories of Homer were passed down through oral storytelling, told from memory, folk tales were passed along the generations in Europe, and still are. In the early 1800s two of the Grimm children (there were five in total) decided they wanted to preserve the folk tales of Europe and copy them down into a proper book, and get it published. Wilhelm and Jakob Grimm gathered stories from friends, neighbours, grandparents, anyone that knew some old traditional tales. Their aim, as stated in The Wild Girl, was to preserve their cultural history and pass on the lessons found in these stories. Napoleon was rampaging through Europe at the time, trying to make everyone French whether they liked it or not, and this only furthered the Grimms’ desire to preserve something of their culture. The path of Napoleon’s army, its successes and failures, and the exploits of his relatives that he installs as monarchs, are charted throughout The Wild Girl alongside the stories of the characters. The war directly effects them as Napoleon’s brother takes over as king in their part of Germany and promptly reduces the people to paupers as he throws lavish parties and spends the soldiers’ wages on new chandeliers. We see the effects of this behaviour, as well as those of the war in general, on the people through the two families at the centre of the novel: the Grimms and their neighbours the Wilds. Dortchen Wild, one of five children, is the ‘Wild Girl’ of the title. We see everything through her eyes throughout the book, and learn of her love for Wilhelm Grimm and her fear of her increasingly tyrannical and abusive father. She is small and brave, a modern Disney heroine with terrible parents, a benevolent, maternal housekeeper, and an illicit love for a forbidden suitor. For Wilhelm Grimm has no money, and few prospects. His only income is his and Jakob’s book of stories, which goes through several incarnations as they try to improve it and get someone to publish it. The two families’ struggle seems to get increasingly hard, and there are some rather bleak sections of the book when everything seems to be going wrong. Collecting the fairy and folk tales keeps them going however, and it is fascinating to hear older versions of tales very familiar to us all, as well as the possible ways in which they were shaped and developed. Dortchen and Wilhelm’s relationship develops as she tells him stories, and we get a real sense of how they lead their lives, and how they deal with life’s difficulties. My only real criticism of The Wild Girl is that it occasionally gets too caught up in the fraught nature of Dortchen and Wilhelm’s romantic relationship, and the fact that they cannot be together. In the last third of the book there are chapters and chapters of romantic drama and back-and-forth between the two characters; really it drags on a bit! And then of course this makes the ending and conclusion feel a little too neat and quick after such prolonged romantic anguish. Other than that I loved The Wild Girl – I loved the concept, the idea, the characters, and the vivid world they live in. Kate Forsyth has done a wonderful job in demonstrating how the stories we know and love came to be in the public consciousness, and how important storytelling is to so many different cultures. As historical fiction it is also excellent, weaving together fact with speculation and examining a sweeping history alongside a close family story. 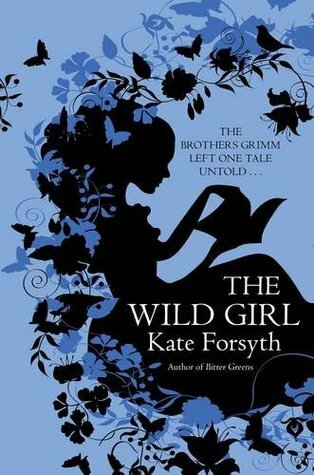 Forsyth’s other novel Bitter Greens (also based around fairy tales) is on my reading list, and I’m sure it will be just as excellent as The Wild Girl. Published in 2014 by Allison & Busby (UK paperback). I’m pleased you enjoyed this. I loved it too and I thought Bitter Greens was even better…I’m envious that you still have that one to look forward to! A magical start to 2015. Thanks!